San Martin Hotel is set in a 27 acre site of lush greenery and woodland, close to the main entrance of the Iguazu Falls National Park and Bird Park. It is also just a couple of kilometres from the airport. The hotel was constructed in 1970. All 135 rooms and suites are spacious and offer comfortable acommodation and a full range of amenities including air conditioning, minibar, TV, and 'phone. Each room has an ensuite bathroom. The Taroba restaurant serves tasty international cuisine in a relaxed and informal atmosphere and there is a separate lobby bar where guests can enjoy sundowners and after dinner drinks. The hotel also has a games room and a gym. There is a gift shop, laundry service, currency exchange and 24 hour room service. As well as visits to the world famous Iguazu Falls, guests can explore the hotel's own gardens and grounds, complete with forest walking trails. There is a good sized outdoor swimming pool plus a dry sauna. Sports catered for include tennis, volleyball and football. The hotel also organises a range a children's activities to keep the young ones occupied and happy. The hotel is also a short walk from the Bird Park, which is a great way to spend half a day seeing the varied and colourfoul birdlife from all around Brazil. Open: San Martin Resort and Spa is open all year. Location: The hotel is adjacent to the Bird Park and just 400 metres from the entrance of Iguazu National Park, and 2 kilometres from Foz de Iguazu international airport, and the hotel provides a shuttle service to the airport. Rooms: There are standard, superior, super class rooms and junior suites. All are en-suite. Standard rooms (16sqm) have 1 double and 1 single bed, air conditioning and heating, satellite TV, phone, minibar, safe, hairdryer and free Wi-Fi. Superior rooms (16sqm) have 1 double or 2 single beds and the same amenities as standard rooms. Adjoining rooms are available. Super class rooms (24sqm) have 1 extra-large double bed or 2 singles and the same amenities. Junior suites (24sqm) have 1 extra-large double bed and a sitting area, and bathrobes and slippers are provided. Activities: Follow the nature walking trail in the hotel’s grounds where you can expect to spot several species of birds. You can visit Iguazu National Park to see the famous waterfalls and explore the rainforest where you can hope to see howler monkeys, ocelots, caiman, tapir and maybe jaguar. The Bird Park is a few minutes’ walk from the hotel and has a varied collection of species including toucans, macaws, cassowaries, harpy eagles and owls. There is a golf course about 3 kilometres from the hotel. Facilities: The hotel has a spa with sauna, Jacuzzi, plunge pool and treatments rooms, gym, and facilities for volleyball, tennis and football. There is an outdoor swimming pool surrounded by a deck with loungers and parasols. Lapacho Video Bar serves a range of drinks and is open from 11:00 till midnight each day. The hotel has a gift shop. The hotel reception is staffed 24 hours a day. There is a laundry service (pay locally). Dining: Breakfast is served from 06:30 to 10:30, and the restaurant is also open for lunch and dinner. Meals are eaten at separate tables. 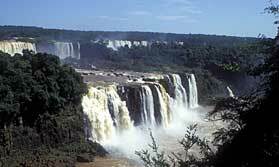 Health: Iguazu Falls is not a malarial area. Communication: There is complimentary Wi-Fi internet access throughout the hotel. "Little character, room with no view and dark corridors and communal areas. Buffet average. On plus side lovely grounds and no need for guide for Brazilian side of the falls as 5 minutes walk to entrance.Tribes Reply: Please note that Iguasu Falls are about a 10 minute drive from the entrance to the park and are not within walking distance of the San Martin Hotel"
"Good room. They couldn't seem to keep up with the volume of people eating from the buffet on our second night and the food and service was nowhere near as good as on our first night." "Clean, comfortable and obviously recently refurbished. Food limited in quality - buffet being the main option. Very close to Brazilian national park (walking distance) but not very close to restaurants." "Large hotel so a little soulless but made up by being in wonderful grounds and next to the Bird Park - an enjoyable half day visit"
"Location great, building great but staff were average because if you did not tip them they were grumpy. Everything had a charge. One internet connection and a child playing games. I asked for assistance at front desk after waiting 30 mn and got a shrug of the shoulders. English was very limited even at the front desk. If they want international tourists they need to recruit multi-lingual people. Roberto complained to his company about the attitude of 2 staff wanting me to tip them."